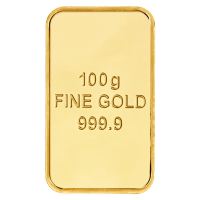 100غ ذهب صافي متنوع These 100 g (3.215 troy ounces) gold bars offer an exceptional value and affordability for your investment. You will receive our choice of this product depending on current availability. All bars are from well known, reputable mints.